After an alcohol related run-in with the law back in March, former "Buffy the Vampire Slayer" star and occasional computer geek on "Criminal Minds," actor Nicholas Brendon checked into rehab. As fans of Brendon, we have been hoping the actor would get his life and career back on track. He pleaded no contest to four misdemeanor charges on June 17, and was sentenced to a one year suspended jail sentence, and thirty-six months of probation. He was also ordered to attend anger management classes. Nick has been making personal appearances this summer and was spotted looking tan and fit at a recent Meet and Greet Event with his fans. (top photo) We are looking forward to seeing him on "Criminal Minds" in Season 6 in his recurrent role as Penelope Garcia's boyfriend, Kevin Lynch. (bottom photo~with Kirsten Vangsness). Here is an adorable clip of Nick with a young fan. 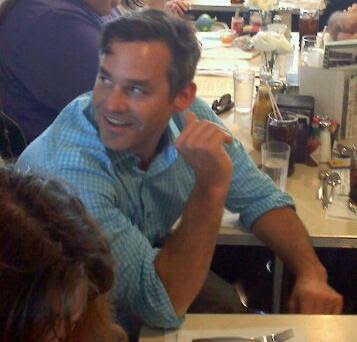 For more photos and Nicholas Brendon news, visit his official website.